Ages 5+. Matinees for schools available. Times are changing on the Island of Hockey Puck. A new Duke is ruling with an iron fist, the old Duke disappeared in a puddle of mystery, and a stowaway named Dull is on the run from it all back to her homeland of Illyria. Inspired by the plays and language of Shakespeare, this world premiere by the acclaimed Trusty Sidekick Theater Company uses puppetry, live music, and a sea of imagination in this world premiere. CSC has made Shakespeare engaging and accessible for thousands of New York City students for well over a decade through actor-driven in-school workshops, performances at our theater, study guides, and much more. NOTE: Children must be accompanied by a parent/guardian age 18 or older at all times. Children younger than age 5/babes-in-arms are welcome to this production. However, should younger children need to leave, another parent/guardian must stay in the theater with any remaining children. Otherwise, the entire party must exit. Food and drink is not allowed in the performance space. 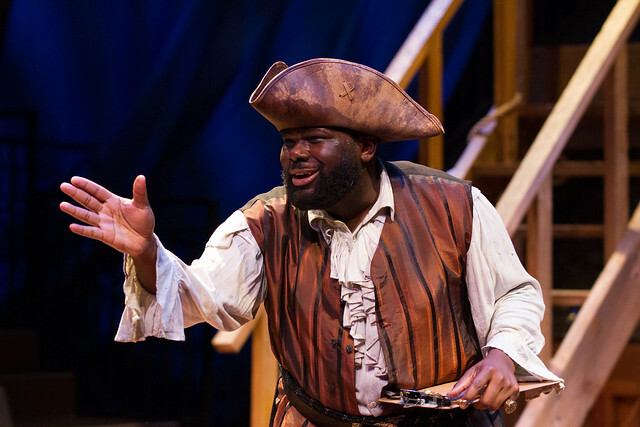 CSC is a participant in the Leadership U: Continuing Ed program, funded by The Andrew W. Mellon Foundation and administered by Theatre Communications Group, the national organization for the professional not-for-profit American theatre. Photos courtesy Trusty Sidekick Theater Company. Photos by Buatti-Ramos Photography.